Yay!!!! I Passed the Praxis text I took tonight. I am so glad I don't have to worry about that anymore. & how do we celebrate? With food of course! Isn't that how people in general celebrate everything special? & if I am being honest, we still would have eaten these if I didn't pass the test. So we made these yummy liege waffles tonight for dessert. 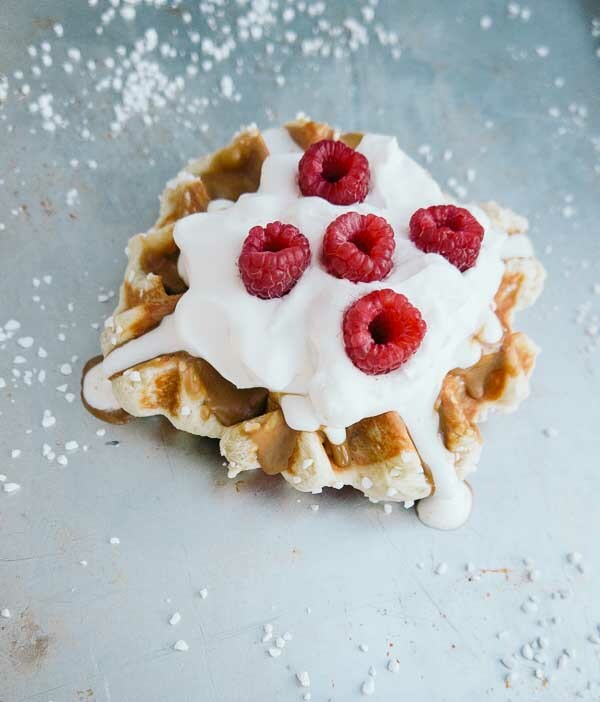 & good news, it is Waffle Love in your home. My favorite part about copycat recipes is the fact that I can put as much biscoff spread or raspberries as I want....& yes I added a raspberry to each bite thank you. I found this recipe from the Oh Sweet Basil blog! add the 1 1/2 teaspoons of sugar to the milk and water and add the yeast, stirring to combine. allow the yeast to proof, or get foamy and puffy. in a large bowl, beat together the butter and sugars. add the egg, honey and vanilla. stir together and add the yeast mixture. place in a standing mixer with the dough hook and add 2 cups of flour. mix until the dough is thoroughly incorporated, and add the remaining flour, cover with plastic wrap and allow to rest for 4 hours, up to 24 hours. then punch down and knead in the pearl sugar. separate into 8 to 10 balls and place on a hot, greased waffle iron. cook until golden brown and serve with biscoff, whipped cream and fresh berries.